Abdelrhman SS, M. Rihan E A-E, , M. Almotairy H, H. Al Jassem A and Al-Blowi MH. ABSTRACT: Two hundred and sixteen samples (80 Tracheal swabs and 136 blood serum) were collected from four commercial ostrich farms in the Kingdom of Saudi Arabia for isolation of Newcastle disease (ND) and Avian Influenza (AI) viruses or detection of their antigens and antibodies by RT-PCR and Enzyme Linked Immune Sorbant Assay (ELISA) respectively. Neither AI and ND viruses nor their antigens were isolated or detected in any of the collected swabs samples. Also, Antibodies to avian influenza virus were not detected in the collected serum samples. Antibodies to ND virus were detected in 0.0%, 80.0%, 74.1%, and 80.0% in serum samples from farms 1, 2, 3 and 4, respectively. Mean ND ELISA antibody titer were 0.0, 646.3, 1068.5 and 1440.5 in farms 1, 2, 3 and 4, respectively. Ostriches vaccinated with live ND vaccine by drinking water were negative for ND antibodies, while ostriches vaccinated with live ND vaccine by spray method and boosted by inactivated oil emulsion ND vaccine gave the highest immune response. Ostriches vaccinated with inactivated oil emulsion ND vaccine (4x chicken dose/ostrich) elicited effective immune response and transferred maternal antibodies to ostrich chicks at the rate of 85.7% and 66.7% with mean ELISA antibody titer of 1450.5 and 1350.15 at 7 and 21 day old, respectively. Key words: Avian Influenza, ELISA, Newcastle disease, ostrich, RT-PCR, Saudi Arabia. Gabanakgosi K., Moreki J.C., Tsopito C.M. and Nsoso S.J. ABSTRACT: The impact of family chickens on the livelihoods of people living with HIV and AIDS (PLWHA) was investigated in Khudumelapye, Mogobane, Mokubilo and Serowe villages of Botswana. The objectives of this study were to determine the consumption and marketing of family chickens and to evaluate the contribution of family chickens towards household income and nutrition of PLWHA in four villages of Botswana. Data were collected from 100 respondents (25 from each village) using a structured questionnaire and through direct observation. The results showed that 79% of the respondents slaughtered chickens for family consumption and 21% to honour guests. Sixty-one percent of respondents consumed eggs while the remainder used eggs for breeding purposes. Seventy-four percent of the respondents sold some chickens to meet immediate family needs. Eighty-two percent of chickens were sold for cash followed by barter (10%). A total of 874 chickens were sold from the surveyed villages earning the sum of P18, 030.00 (2253.75USD). The average price of a chicken was P57.50 (7.19USD). These results suggest that family chickens were mainly used for consumption and were also sold to meet family needs, thus contributing to improved household income and nutrition of PLWHA. In order to increase the benefits of rearing family chickens, the rearers should be trained in general poultry management. In addition, the rearers should be encouraged to form associations which will assist in marketing chickens. Key words: Family chickens, food security, HIV/AIDS, income, nutrition, PLWHA. Alloui N, Alloui MN, Bennoune O, Bouhentala S.
ABSTRACT: This study was carried out during summer season on two broiler buildings with a capacity of 10000 each one. The first building with natural ventilation while the second was recently renovated with dynamic ventilation system composed of 10 ventilators with a capacity of 5000 m3/hour/unit. The results of this experiment showed that ammonia concentration was higher in the building with natural ventilation during various breeding phases. The average concentration of ammonia in the building with natural ventilation was already higher than standard levels from the third week of breeding (16.5 ppm) and reached higher and alarming levels at the seventh week (31.5ppm). Dynamic ventilation in the second building made possible decrease in this concentration that reach 19.5 ppm at the fourth week and 13.50 ppm at the end of breeding (week7). The variation of the ammonia levels in the building with dynamic ventilation is in close relationship to the ventilation flow and working time of the extractor fans. Mortality in the building with natural ventilation was twice higher than that with dynamic ventilation (10.5 vs. 4.5%). The presence of dynamic ventilation has also positively influenced the performance parameters of chicken. The day56, live weight of broiler chickens in the poultry house of dynamic ventilation was superior to that of broiler chickens in building of natural ventilation (1870 vs.1682 gr). This is confirmed by better feed conversion (1.98 vs. 2.66). In the building with natural ventilation, examination of 50 chickens shows the presence of conjunctivitis in animals (20%). Rudraswamy M.S. and Chaithanya A.
ABSTRACT: Actovet CRD (A.CRD) is a blend of ayurvedic herbs (Glycorrhyza glabra, Adhatoda vasika, Pipper longum, Abis Webbiana, Azadirachta indica, Curcuma longa etc) which have known therapeutic effect on respiratory system and other systemic diseases with positive effect to boost immunity. To find the efficacy of A.CRD and to optimize its level of supplementation against the chronic respiratory disease (CRD) three age groups of broilers viz., 0 day, 14 day and 28 day representing the age groups of 0-2 weeks (T1), 2-4 weeks (T2) and >4 weeks (T3) of age respectively were isolated for the experiment from a large size group of birds from each of five farmers. The results of the trial indicated that A.CRD improved the body weight gain, survivability, haemoglobin, PCV, total protein levels significantly (P≤0.05). The symptoms of the CRD in the infected birds subsided within a week period of treatment. The birds stopped gasping, rales and other symptoms of the CRD within 4-7 days of treatment at all therapeutic dosage levels. The results indicated that the birds of age group T1, T2 and T3 should be supplemented with A.CRD at the rate of 10, 20 and 40 ml/100 birds respectively. The birds did not show any symptoms of drowsiness, off feed which is usually observed in antibiotic treatment. The results showed that A.CRD can replace antibiotic therapy. Hence, this herbal formulation can be used for prevention and treatment of CRD and a suitable supplement for organic poultry farming. 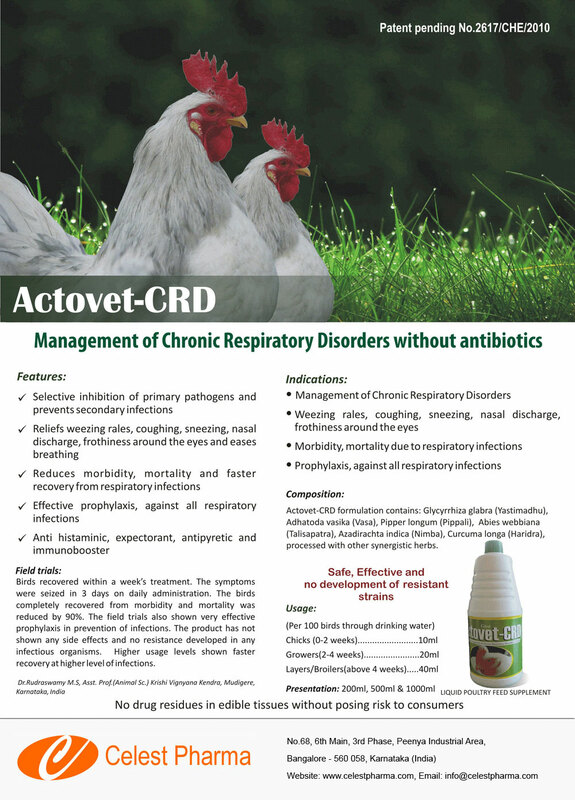 Key words: Actovet-CRD, Antibiotic Resistance, Chronic Respiratory Disease, Herbal Formulation, Organic Poultry Farming, Poultry. Saeed A.A., Hasoon M.F. and Mohammed M.H. ABSTRACT: This study was conducted to determine the prevalence of Salmonellae contamination of chicken meat imported from different origin to local markets in south of Iraq (Diwaniya). The bacteria were cultured, isolated and biochemically characterized by the analytical profiling index (API 20E system). The 16s rRNA and invA gene primers were selected specifically for the detection of Salmonella to amplify a 406 and 558 bp DNA fragments, respectively. The results of this study showed that 22 Salmonella isolates were detected by polymerase chain reaction (PCR) from 100 chicken meats and only 7 isolates out of 22 were identified as S. typhimurium, the highest percent of isolates were 83.8 % for India origin and the lowest percent were 25% from Jordan origin.